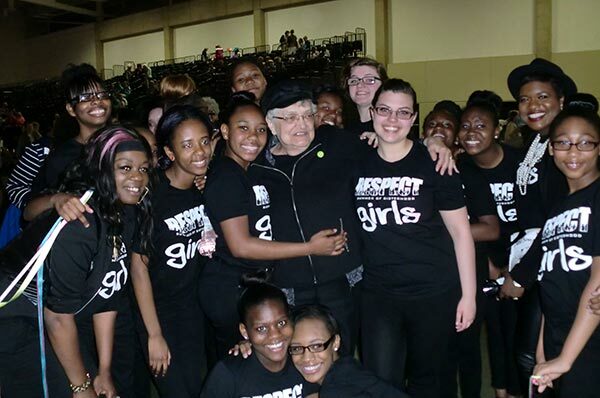 More than 6,500 women came together April 25-27 to “Make it Happen” at United Methodist Women Assembly 2014 in Louisville, KY.
North Coast District UMW President and WSCH Board Member, Margaret Bullard with the girls from West Side Community House Summer of Sisterhood after their performance at the 2014 Assembly. East Ohio was well-represented in the audience and on stage. Summer of Sisterhood performed Friday and Saturday at the Kentucky International Convention Center. The girls participate in the after-school and summer program at The West Side Community House in Cleveland (North Coast District). The keynote speaker for Assembly 2014 was former First Lady and U.S. Secretary of State Hillary Clinton. Her appearance by the life-long Methodist was reported by the denomination as well as the local and national media. Kolograf said that Clinton posed for pictures with and took the time to personally greet each of the 25 girls from Summer of Sisterhood who were in Louisville. She said the experiences the girls brought home with them from Assembly 2014 will make a lasting impact.